This page contains work on which I was the primary author and had significant creative control. For more commercial work, see my commercial portfolio. You, Mary Jane Minsky, have a few things to clear up with your best friend Jenny Yoshida. When your robotic birthday gift doesn’t go over as planned, you may need to reset your expectations, for her and yourself. The Mary Jane of Tomorrow was written by Emily Short as a prize for Steph Cherrywell, who won IF Comp 2015 with Brain Guzzlers from Beyond! The game is set a little while after the events of Brain Guzzlers, making use of Steph’s setting and characters with permission. This is a lightly puzzly parser game with substantial procedural text components: as you train and retrain the robot, it gains both new conversation topics and new styles of dialogue, until you have styled her exactly the way you want. Cover art contributed by Steph Cherrywell. One cannot say one has truly enjoyed the place without trying the local specialty, spicy heart baked in a buttery crust. People around here insist on leaving at least three bites behind to indicate that one has been sated. Failure to observe this custom may result in the innkeeper providing additional servings with or without the guest’s permission. The book includes an extensive making-of section which discusses technical and aesthetic aspects of procedural text generation. 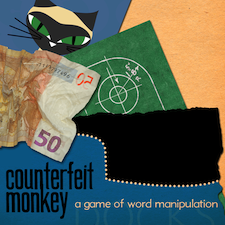 Counterfeit Monkey won five 2012 XYZZY awards including Best Implementation, Best Individual PC, Best Puzzles, Best Setting, and Best Game; and received a 9.4 from GameTrailers.com. It has been described as “like Portal for English” (JP LeBreton). First Draft of the Revolution is an interactive epistolary novel set in an alternate version of the French Revolution. Liza Daly commissioned the piece and created the code base to support the interactive letter-writing concept; inkle worked on the graphical design and packaging. 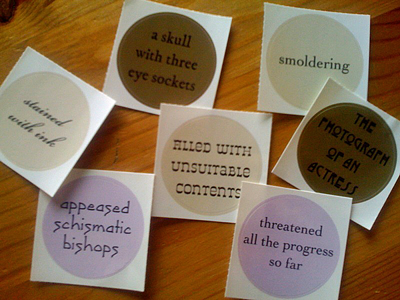 First Draft of the Revolution won a 2012 XYZZY Award for Best Use of Innovation, and was nominated for Best Story. Download File: Available as an epub. License: Creative Commons Attribution (CC BY 3.0) license. San Tilapian Studies is a casual narrative game played live with a group of 20+ people. To my knowledge, a variant of San Tilapian Studies has been played with at least three groups aside from the guests at the party for which I created it. The rules and a description of the play experience can be found here. Please feel free to borrow and adapt the rules if you would like to play yourself. Sooner or later, you’re going to lose. Only one person wins the National Spelling Bee each year, so an elementary understanding of the odds means it almost certainly won’t be you. The only question is when you fail, and why. Bee is a story about the story of a home-schooled girl preparing to compete in the national spelling bee, dealing with various small crises with family and friends, and gradually coming to terms with the clash of subcultures involved in belonging to a family like hers. Bee was nominated for 2012 XYZZY Awards for Best Writing and Best Game. Website: Currently unavailable, as the host site has gone offline, but you can access reviews and discussion here. Alabaster is a collaborative work by John Cater, Rob Dubbin, Eric Eve, Elizabeth Heller, Jayzee, Kazuki Mishima, Sarah Morayati, Mark Musante, Emily Short, Adam Thornton, & Ziv Wities, and illustrated by Daniel Allington-Krzysztofiak. ‘Don’t go back,’ they say, and ‘When will we ever see you again?’ But you imagine they will find consolation somewhere. Your father hangs back, silent and moody. He has spent the week as far from you as possible, working until late at night. Now he speaks only to ask whether the Beast treated you ‘properly.’ Since he obviously has his own ideas about what must have taken place over the past few years, you do not reply beyond a shrug. You breathe more easily once you’re back in the forest, alone. Bronze is a puzzle-oriented adaptation of Beauty and the Beast with an expansive geography for the inveterate explorer. Features help for novice players, a detailed adaptive hint system to assist players who get lost, and a number of features to make navigating a large space more pleasant. The beautiful life is always damned, they say. As for you, you’ve overexpended yourself: fifteen years of prominence, champagne, carriage rides in the Tuileries, having your name whispered behind manicured hands, getting elegant ladies out of elegant fixes – and you’re in debt. Bound by oath and honor to a pack of scoundrels. Your father, old peasant that he was, could have warned you against their type. 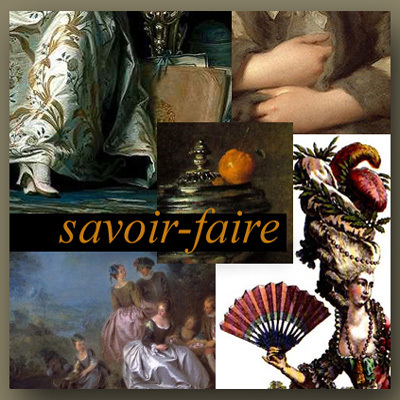 Savoir-Faire was nominated for eight XYZZY awards in 2002, and won four, including “Best Game”. Galatea is my first released foray into interactive fiction. It is a single conversation with a single character, which can end any of a number of ways depending on the player’s decisions. Despite its age, I continue to get strong reactions to it in my email inbox on a fairly regular basis. Some people love it; some people find it annoying or distressing. Galatea has what I call a multilinear plot: unlike traditional IF, it has no single path to victory. Instead there are a large number of endings, some more satisfactory than others, of which many could be considered “win” states. It takes only a few minutes of play to arrive at an ending, but considerably longer to find all of them.